Introducing a fully automatic touch-less motorcycle wash–like nothing else in the U.S. Hog Wash takes on its first motorcycle. Introducing a fully automatic touch-less motorcycle wash, operating at a PSI, certified by Harley Davidson. Hog Wash never uses harmful chemicals, those corrosive waxes that lend to damaged wiring or the chemicals that may harm leather, chrome, or paint. Hog Wash sprays at an angle, designed to avoid hitting bearings. Hog Wash offers the first of its kind, a fully automatic touch-less motorcycle wash. Though the fully automatic touch-less motorcycle wash is popular in France, where the volume of motorcycles outnumbers the number in the U.S., the Hog Wash is the only motorcycle wash in the five-state area. 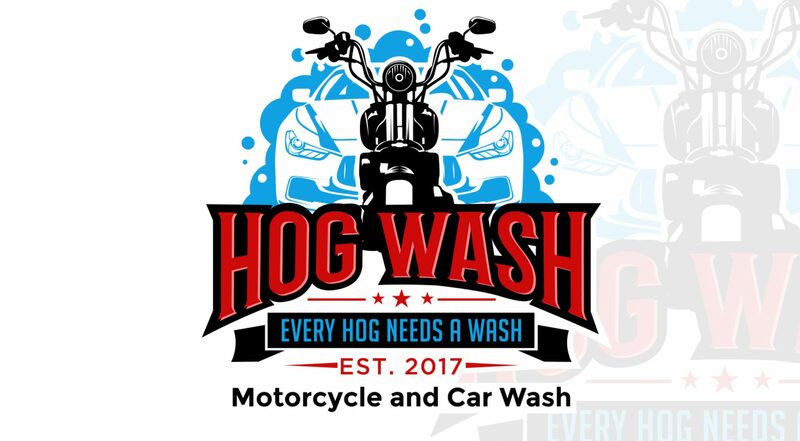 The Hog Wash Motorcycle Wash is touch-free and fast, and in minutes, your bike will be spot free after a front and rear tire rotation, a two-step pre-soak, a 600 psi mid pressure rinse, a protectant, two passes of spot free rinse, and a 10 H.P. on-board dry involving two passes over the seat and one over the remaining part of the bike. The bay wash platform uses a steel front-wheel capture, rotating conveyor, integrated pre-soak, and a high-pressure wheel/tire clean. A length measuring is utilized for optimum cleaning. The wash includes a kickstand capture, a stabilizing system, overhead carriage, variable frequency controlled tape drive carriage movement, and a contouring spray arch with an alternating offset for difficult areas and smooth radial cover. Hog Wash utilizes V-jet nozzles and a UL Listed Motor Control Center. With the push of a button, the wash begins, and verbal instructions and cues are provided. Our sitting room offers extravagance and comfort while you wait.